I promise to use it only to send you Ann's Scrampin' World Newsletter. Custom Made Cards For Every Occasion. 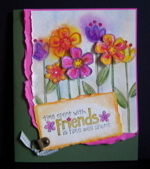 Sharing Ideas Using Various Stamping And Embellishing Techniques. 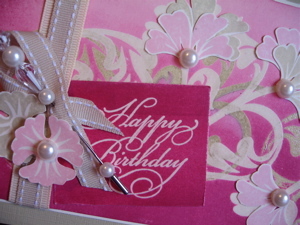 Cards received on special occasions let the recipient know that they have been remembered. Those that have been hand-made tell the recipient that you cared enough to create something special for them. You don't have to be an artist to be able to produce great results - you just have to think a little about the person- what they like, what is the occasion, can you deliver it in person or will it be posted. All these factors influence the style and type of the finished product. There are many products available on the market that help you become an artist. Items like Rubber Stamps give you the opportunity to create many different results from the one image. You can stamp it, emboss it, colour it in, layer it, cut it out and make it glitter. Whatever you do will help you create something unique that will be treasured by the recipient. Another way of creating memorable results is to use Commercial Images. You can gather these from many sources. Cards you have received, magazines, even newspapers (you can't go wrong with black and white for adults) make excellent backgrounds or focal points. You can also download images from the computer. (Don't forget to check for copyright restrictions) Usually these will be mixed media and lean towards being artistic rather than crafty - the result is entirely up to you. 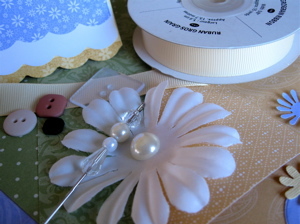 Embellishments add the finishing touch to your creations. You can dress them up or down by your choice of embellishment(s) which might include ribbons, buttons, brads, eyelets, pre-cut shapes, sequins, lace, pockets or tags. Where can you buy embellishments? Should you go for quality or quantity? Will embellishments improve the appearance or detract from the greeting? Can it be mailed through the Postal service if it has lots of embellishments? Discover more at Create Your Own Embellishments. You'll find many creative ideas to inspire you. There are many occasions that we celebrate where a card serves as a lasting reminder. It is usually small enough to store in an album. a box or other memory container, and while we give a lot of attention to the front, it is important not to forget the words inside. It seems to be the modern trend for the insert to be blank, so you can add your own greeting. Sometimes it is difficult to find just the right words. You can find ideas and verses for many occasions, by looking at poetry, famous quotes, song lyrics or making up your own limericks. The latter is always great fun and can be about the recipient. There is some etiquette to be observed when designing and creating verse. All content on this web site is the sole responsibility of Ann Craig, Independent Stampin' Up!® Demonstrator. The use of, and content of the classes, services, or other products offered on this website is not endorsed by Stampin' Up!